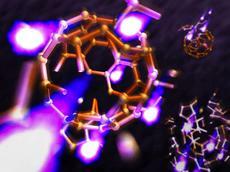 Using intense X-ray flashes, scientists have watched tiny molecular footballs explode. The molecules called buckminsterfullerenes or buckyballs for short are made of 60 carbon atoms and disintegrate completely in less than 100 femtoseconds (quadrillionths of a second). The study shows that the buckyballs explode in a way that can be predicted by theory, as the team led by Prof. Nora Berrah from the University of Connecticut and DESY scientist Prof. Robin Santra from the Center for Free-Electron Laser Science CFEL report in the scientific journal Nature Communications. This is an important milestone for the investigation of individual complex biomolecules like proteins with devices called X-ray free-electron lasers (XFEL). “We were quite impressed that such an incredibly short and dynamic process can be described in surprising detail with existing classical methods, only adding a dash of quantum mechanics,” says Santra, who is also a professor at the University of Hamburg and a member of the Hamburg Centre for Ultrafast Imaging CUI. “When investigating the structure of individual molecules, it is of great importance that you can simulate the process to get an idea of what is going on in your experiment,” emphasises Berrah. X-ray free-electron lasers (XFEL) are new devices that rely on powerful particle accelerators. Using high-energy electrons from the accelerator, an XFEL produces ultra-short and super bright X-ray flashes. Scientists use these flashes to peer into the world of molecules and atoms, revealing the structure of complex compounds like proteins. Knowing the structure of a biomolecule leads to a better understanding of its function, which is important for the development of new, tailor-made medicines, for instance. Currently, researchers apply XFELs to tiny nano-crystals of proteins to elucidate their structure, as, among other advantages, crystals produce a much brighter signal than individual molecules in the X-ray beam. But many biomolecules are notoriously hard to crystallize and for most of them a crystal is not a natural state. Therefore the ultimate goal is to investigate the structure of individual, non-crystallized molecules. The structure of a molecule can be calculated from the characteristic way of how its electrons scatter X-rays. But one important challenge is that through the photoelectric effect, a large amount of X-ray energy is absorbed by the electrons, immediately altering their configuration and with it the way the remaining X-rays are scattered. This problem cannot be circumvented by shorter exposure times, as the absorbed fraction of any X-ray flash is always much larger than the scattered fraction. To monitor this process, the researchers used the world´s most powerful X-ray laser, the Linac Coherent Light Source (LCLS) at the US National Accelerator Laboratory SLAC, and chose buckyballs as a well-known, moderately complex test system. The C60 molecules have a very regular shape that looks like a football, albeit less than a nanometre (billionth of a metre) across. “The bright X-rays knock a large number of electrons out of the molecule, its atoms become more and more positively charged and the electric repulsion finally lets the molecule explode,” explains Berrah. The scientists recorded the debris of the molecular explosion and compared it with a simulation developed by DESY scientist Dr. Zoltan Jurek from CFEL. “Such simulation tools were originally developed for things like liquids and polymers that are at or near equilibrium, not for the high energies and strong forces we see here,” explains Jurek. “People have started simulating XFEL-induced processes about ten years ago, but nobody knew if this would really work.” The experiment at the LCLS provides the first systematic test of these simulations. Apart from scientists from DESY, the University of Connecticut and SLAC, the team comprised researchers from Western Michigan University, Uppsala University, Oxford University, Instituto di Metodologie Inorganiche e dei Plasmi in Rome, Imperial College London, University of Turku, University of Texas, the Synchrotron SOLEIL in France, and the Japanese Tohoku University.